It's still so very cold with no hint of Spring. We can have a spring in our step though and on the streets there are suddenly so many Converse All Stars and Nikes everywhere, replacing boots and high heeled shoes. I bought a pair of classic black mono canvas Converse All Star Hi's. Fashion designers are catching on to the fact that a sporty look suits the busy modern lifestyle. There are lots of sweats and hoodies around - sweats are often coming up fashionably cropped this season. 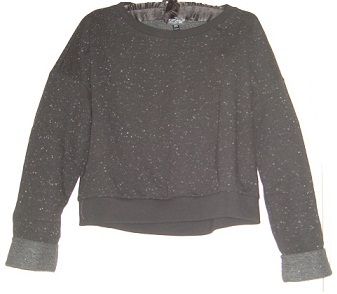 I bought Topshop's Black Neppy Crop Sweat. The black cotton mix jersey material has a little white fleck in it. I thought this little gold spike necklace from Accessorize was just right for this season's looks.